I knit a "Wee Owligan" for my little guy in powder blue-- Quince Chickadee in Glacier. I was clearly going to run out of Glacier yarn, so I trimmed it in Chickadee in Twig, a combo I never would have thought of but that was surprisingly lovely. Looking forward to seeing how your powder blue little person sweater turns out. Your bungalow sounds interesting, no wonder you have been so busy. I hope the move goes well and you can find some time to enjoy the summer. congratulations on a new home! that is busy work, and tiring work. Love the little knit in the powder blue. So pretty!! have fun moving in, I hope you'll show photos too. Whoa, that's a big step. Happy new home!! Eeeek! I cannot wait to see pictures of the new house -- and maybe I'll get to see it in person? I'm going to be in Chicago for about a month Jan-Feb 2018 and would love love love to see you. 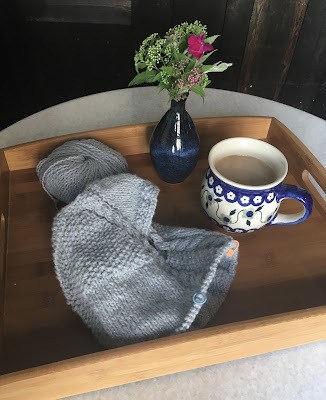 It's been far too long, and even though I did pick up the knitting again this week (a simple pinwheel for a friend's baby), I haven't found the time to blog -- but also can't quite bring myself to shutter the thing... I'm so happy to see all is well!